In 1984 I became a mom. I was still in high school. My son Greg was born 9 weeks early and weighed 3 and a half pounds. While he grew in an incubator in the hospital, I finished both high school and my first quarter of college. My son’s learning difficulty started early. He had trouble focusing and staying still. The more people tried to force him to sit in a classroom, the worse his frustration grew. He was singled out for visits to the principal, suspensions, bullying from not just other kids, but by parents who felt their child wasn’t getting the education they needed because of his behaviors. By 5th grade I’d run out of options. He was expelled from school for fighting. I was working two jobs. I pulled him from school and began to homeschool despite threats from the superintendent who warned me that he wouldn’t get the socialization he needed. I reminded him that my son was beaten brutally by another 5th grader while he was at school. His school refused to take action. 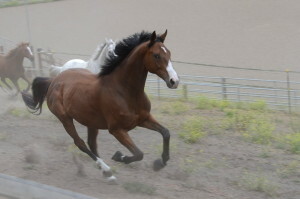 s ecurity guards – all retired policemen at the racetrack where I worked to the horseshoer who cared for our horses – my son learned by doing and moving. He began to believe he wasn’t stupid or unable. In 2004, we started Square Peg Ranch. My son was now a young man, working on a farm in Maui. He’d left high school and was looking for his place in the world. In Maui, he re-discovered nature and beauty. 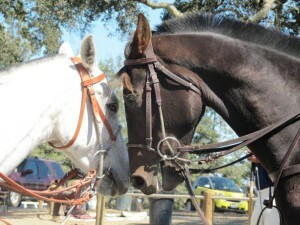 He was riding horses again and was mentored by the local polo pro who taught him the game he loves. 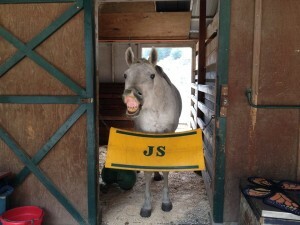 Alone, he explored the Haleakla Volcano by horseback for days on end. 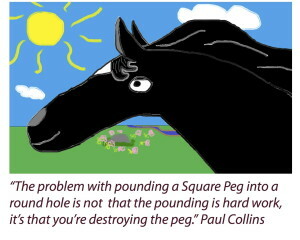 As his life began to take shape, this thing called Square Peg did as well. I knew how much kids who didn’t feel like they “fit in” needed a place where they were valued and accepted. 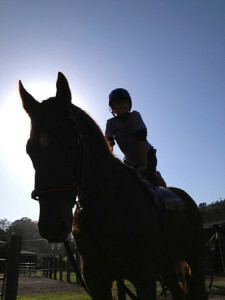 I also wanted to provide a space for the horses who didn’t fit in – mainly failed race horses could find safety. 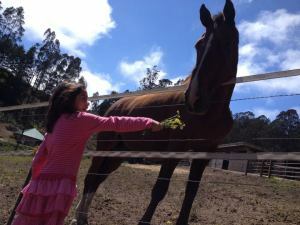 My thought was that these kids would care for the horses and both would find peace and safety. 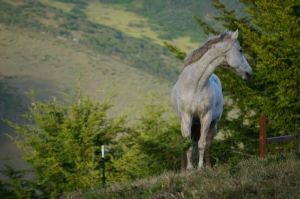 Twelve years later we are on 110 acres, with 19 horses, three dogs, a couple of goats and a thriving population of families who know the loneliness of having nowhere to fit in. 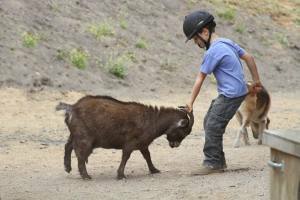 At the ranch, difference is celebrated – childhood is revered. The animals reflect back the innocence and the curiosity that the students project. The natural setting creates a space with minimal sensory triggers – the things that often bring about behaviors such as aggression or elopement (running away) or the dreaded autism tantrums – (crying and screaming jags that can last hours). 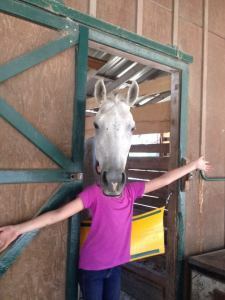 The environment we developed at the ranch is set up so that there is an inherent feeling of peace for the parents and the animals and especially for the students. Laughter is the original communication because it imparts the permission to be joyful. The experts say that people won’t care what you do – they care why you do it. 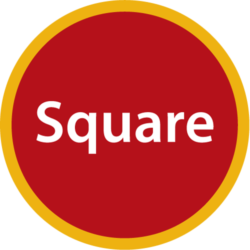 Square Peg was dreamed up by a young mother with a child that needed to move and to be encouraged for his curiosity and to have his kindness understood as a strength. 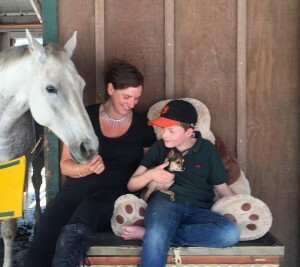 It was created to make a space for ex-racehorses who had given their all on the track and now needed to have a place where they were safe and needed and cared for. 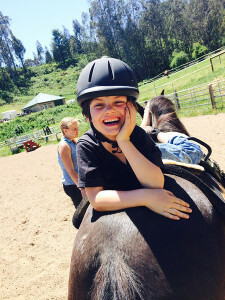 Square Peg was built for a parent who was desperate for her child to be understood and even admired and where that parent could hear the magical sound of her child laughing. Square Peg built a reputation of trust with these families by putting human dignity first – and that has made all of the difference. Square Peg will be successful when nothing we do is special. We work tirelessly to make that happen. We show the world that a person’s dignity is sacred and worthy of reverence. 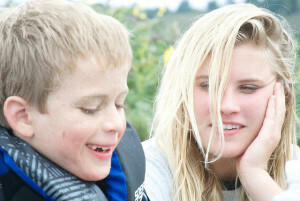 To help others understand that a child’s curiosity is a force more important than facts and procedures and that the most important skills in life – joy, self advocacy, building community and compassion are essential to cultivate and encourage so that these “Square Pegs” can live up to their potential. When neuro-diversity is the new cool we will know we are successful. This is my personal request for you to join the Revolution. Together we will make change for these families and for the millions of families like them, we offer a ray of hope. What follows is a modest proposal we aim to have funded by June 1, 2016. To prove Support and Environment are the KEYS to success in learning and in behaviors for children on the Autism Spectrum. Movement Method™ takes the best of scientifically researched and proven methods and added the secret ingredients: Care and Engagement. 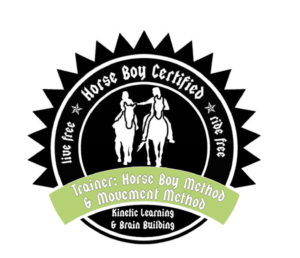 To understand Movement Method™ Learning you need to first understand how two hormones, oxytocin and cortisol, affect a child with autism’s ability to learn. Cortisol is the stress hormone. It is released by the amygdala and produces the flight or fight response. Cortisol is necessary for us to function successfully. It is what allows us to escape from or fight a threat and stay safe. However, it is also likely to impair our ability to receive and retain new information. In contrast oxytocin is the “feel-good” or pleasure hormone. 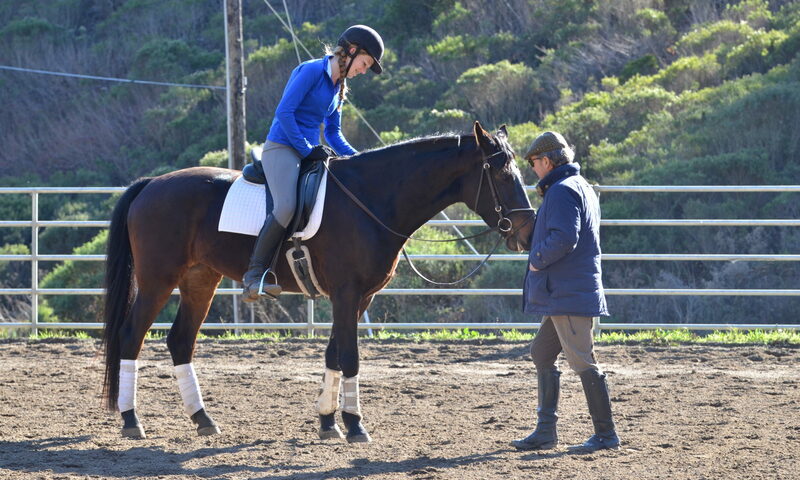 It is a vital part of the mammalian care-giving system and allows us to down-regulate the stress caused by cortisol. Oxytocin allows us to feel safe. When we feel safe we have more attention available to focus on new concepts and to learn. It is well-established that children with autism have an over-active amygdala which causes increased cortisol production. It is therefore essential to decrease their cortisol production and increase their oxytocin production in order to help them learn. If you want a child with autism to learn then you need to create an environment that is conducive to learning. The ideal learning environment is set-up to increase oxytocin and reduce cortisol production by targeting the child’s sensory needs and allowing the child to move (PHYSICAL ENVIRONMENT). In addition the child is taught in a flexible, fun and pressure free way through their passions and intrinsic interests (HUMAN ENVIRONMENT). When both the physical and human environment is set up correctly the child advances quickly in terms of their perspective taking, social and life skills, academics and self-advocacy (LEARNING). 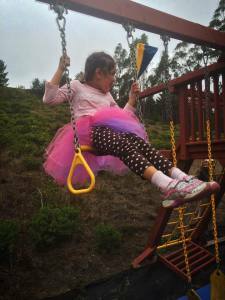 Autism Families of the Bay Area including San Mateo, San Francisco, and Santa Clara Counties – the autistic children rage in age from 4 to 16 years old – their siblings range from 3 to 19. We plan to intensely serve 16 children in the summer of 2016 with these programs. These children will receive over 1,200 total hours of one on one hours with certified therapists at the site in the summer of 2016. With this grant, we will create a self sustaining teaching model, through home school associations and parent participation, insurance and Regional Center support after this first year. The need is tremendous for these families to have a safe emotional space for learning and exploration in a safe physical and emotional environment. Each child will receive an initial assessment from a Board Certified Behavior Analyst and Educational Consultant. This is a collaborative effort between parents and credentialed professionals. This assessment will provide a baseline measure for the participant in the domains of communication, behavior, social development, and activities of daily living. Goals will be created for each domain by the BCBA and carefully tracked by the one on one therapists. 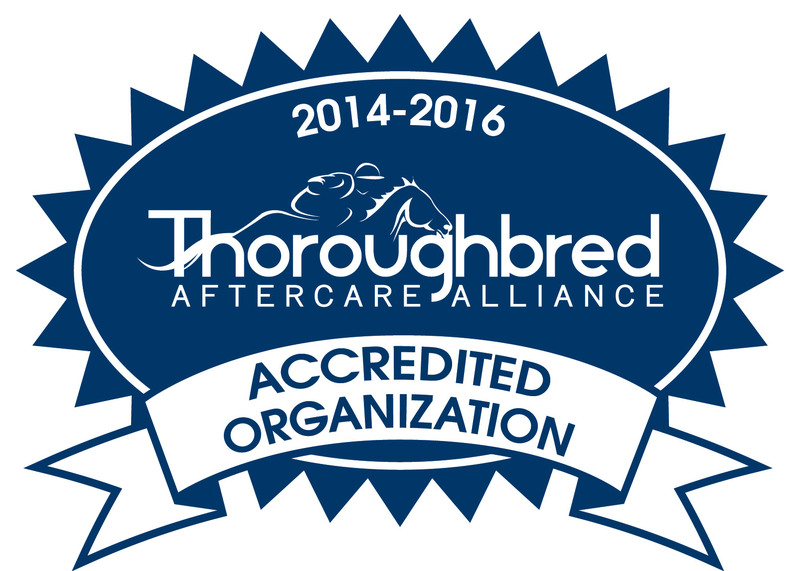 At the end of the summer, a progress report will reflect the growth of each participant. An annual report will be complied for the program that reflects the number of mastered goals in each domain. Each hour spent with trained staff will be recorded and measured against the initial assessment and goals using the latest technology in ABA Therapy. Through these tools, behavior and academic goals and activities data will be constantly reviewed by peers, by the families and by the attending specialists. 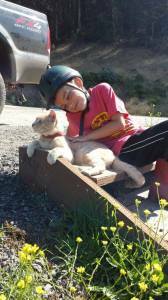 Square Peg has been serving autism families and rescued animals in Half Moon Bay since 2004. Cognitive breakthroughs in communication, social interaction and self advocacy are a daily happening here. Our methods are effective, compassionate and sustainable. This document seeks to expand and deepen our work for this very worthy population and to inspire other programs to expand their reach and better utilize their operations. 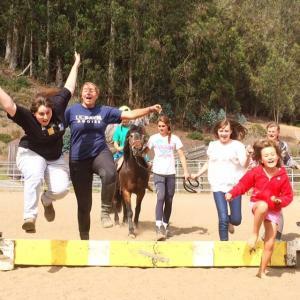 Twelve years ago, Square Peg Ranch set out to change the dynamic we saw at many therapeutic riding programs. 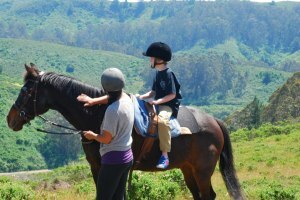 Instead of going to the ranch because you have autism, or a related neuropsychiatric issue – families come to the ranch because the horses need them. The notion of meaningful care of other non verbal beings alongside others in a community based on caring is a life changer for many of our families. HIS CHOICE: “At Square Peg, Connor has no disability. The world isn’t hard. I believe that hearing laughter gives us strength. A strain of bacterium in soil, Mycobacterium vaccae, has been found to trigger the release of seratonin, which in turn elevates mood and decreases anxiety. Seratonin is also thought to play a role in learning (Jenks & Matthews, 2010). This is amazing. I am putting some funds in. I am also a mom with a very personal journey that I had turned into an effort to help others in the spectrum.